Miyamoto Musashi (1584-1645) is the most famous Samurai who ever lived. His magnum opus, the Go-Rin-Sho or Book of Five Rings is a classic that is still read by tens of thousands of people each year--Japanese and foreigners alike. Alex Bennett's groundbreaking new translation of The Book of Five Rings reveals the true meaning of this text for the first time. Like Sun Tzu's The Art of War, Musashi's book offers unique insights, not just for warriors, but for anyone wanting to apply the Zen Buddhist principle of awareness to achieve success in their endeavors. This book sheds new light on Japanese history and on the philosophical meaning of Bushido--the ancient "code of the Japanese warrior." Unlike other translations that are based on incomplete and inaccurate versions of Musashi's work, Bennett's is the first to be based on a careful reconstruction of the long-lost original manuscript. 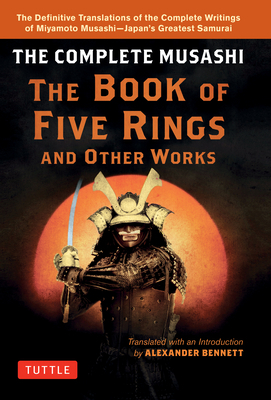 Capturing the subtle nuances of the original Japanese classic, the result is a far more accurate and meaningful English version of The Book of Five Rings text. Richly annotated and with an extensive introduction to Musashi's life, this version includes a collection of his other writings--translated into English for the first time. A respected scholar, as well as a skilled martial artist, Bennett's understanding of Musashi's life and work is unparalleled. This book will be widely read by students of Japanese culture, history. military strategy, and martial arts. It sets a new standard against which all other translations will be measured. Alex Bennett has two doctoral degrees in Japanese literature and history from Kyoto University and the University of Canterbury (NZ). He is a professor in Japanese history, martial arts and Budo theory at Kansai University. He is Vice President of the International Naginata Federation, International Committee Member of the All Japan Kendo Federation, Director of the Japanese Academy of Budo, and he is Head Coach of the NZ Kendo national team. He co-founded and publishes Kendo World, the first English-language journal dedicated to Kendo. He holds black belts in several martial arts--Kendo Kyoshi 7-dan, Iaido 5-dan and Naginata 5-dan. His published works include Japan: The Ultimate Samurai Guide and Hagakure: The Secret Wisdom of the Samurai.